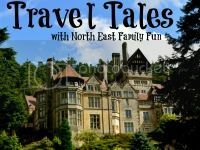 Welcome to #TravelTales - the place to link up your local, UK and worldwide day trips, short breaks and holidays. Thanks to all who linked up last month, I loved reading about such varied trips ranging from a Cliff Railway from Renovation bay-bee to A road trip in the Netherlands from Babyfoote and a trip to see the Roman Baths from Based on a True Story. Now it's your turn.....can't wait to read this months posts! Got back off holiday last week and promptly had an evil summer cold, grr, so just catching up on everything now.